The Six Tones is participating in the Creative Fellowships Initiative in partnership with School of Music. The Six Tones and Garth Knox will be performing at the Harry Partch Festival on Friday, May 11. The Six Tones are two Vietnamese performers, Nguyễn Thanh Thủy (who plays đàn tranh) and Ngô Trà My (who plays đàn bầu), and the Swedish guitarist Stefan Östersjö (also playing many other stringed instruments). Nguyễn Thanh Thủy was born into a theatre family and was raised with traditional Vietnamese music from an early age in Hà Nội. She studied at the Hanoi Conservatory of Music where she received her diploma in 1998, followed by a Master of Arts at the Institute of Cultural Studies in 2003. 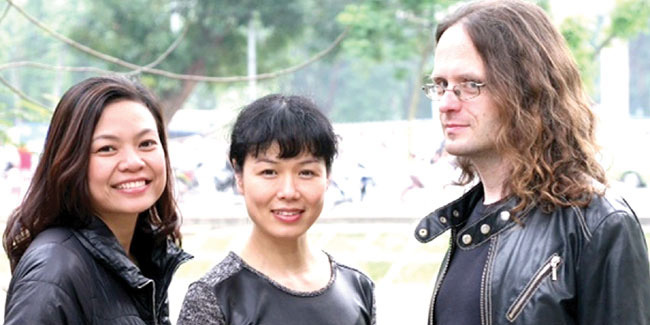 Since 2000 she holds a teaching position at the Vietnam National Academy of Music. Ngô Trà My studied at the Hanoi National Conservatory of Music, where she received her diploma in 1994 and a pedagogical exam in 2007. Since 1994 she teaches the đàn bầu at the conservatory in Hanoi. She has performed at festivals in China, Spain, Korea, Scandinavia and Vietnam and has recorded one CD as soloist with orchestra: Lời ru quê hương (Lullaby of the Native Land) – 2001. Born in 1967, Stefan Östersjö is one of the most prominent soloists within new music in Sweden. Since his debut CD (earning a Swedish Grammy in 1997) he has recorded extensively and toured Europe, the US and Asia. His special fields of interest are the interaction with electronics, and experimental work with different kinds of stringed instruments other than the classical guitar.